A heat pump is an investment in your comfort and health for many years, so it would make sense to invest in the best. This is why you may want to consider the Designer High Wall Heat Pumps for their Award Winning Design, style, quietness and absolute comfort. Mitsubishi Electric Heat Pumps are known to heat more effectively and quietly than any other heat pump in New Zealand and that’s the reason why Kiwis love them. They’re designed with heating in mind, not cooling like most other heat pumps, which means they’re better equipped to warm your home. With an advanced “Silent Mode” fan setting, the range starts from a super quiet 21dBA. This allows you to relax and enjoy the cosy warmth and clean quiet air from the Designer Series, coupled with a powerful but quiet performance. With the combined features of efficient technology and unique energy saving, the Designer Series systems contributes to reduced energy consumption in your home or workplace. This is the world of Mitsubishi Electric heat pumps – they are very stylish and very, very quiet. 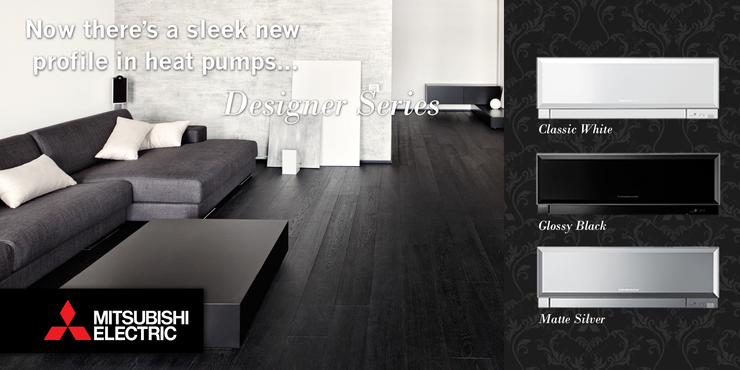 Contact us to find out more and let us introduce you to many more benefits of this Designer Series range. The Designer High Wall Heat Pumps take heat pumps to the next level. With exceptional energy efficiency and Award winning design, you can choose from a range of contemporary colours. All with elegant clean lines you can choose from glossy black, matte silver or classic white to complement your decor and reflect your personal interior.